The King of Comedy, Jerry Lewis (Damn Yankees!) 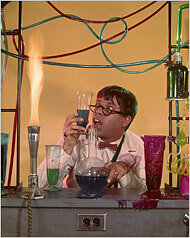 is bringing the 1963 movie he directed, wrote and starred in – The Nutty Professor – to the Broadway stage in 2010/2011. He will sit in the director’s chair this time round, working alongside composer Marvin Hamlisch (A Chorus Line, They’re Playing Our Song, The Sweet Smell of Success, The Goodbye Girl, Smile) and librettist/lyricist Rupert Holmes (Curtains, The Mystery of Edwin Drood, Accomplice, Solitary Confinement, Say Goodnight Gracie). Casting and the rest of the production team has yet to be announced. My first horrible typo…sorry Jerry LEWIS.